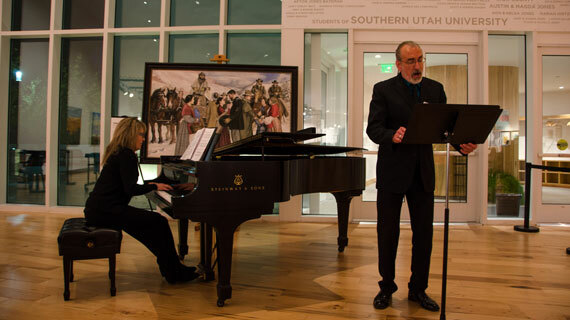 Join Southern Utah University’s Department of Music for their annual Soirée Faculty Recital. The recital will be held on Monday, October 8, 2018, at 7:30 p.m. in the Thorley Recital Hall of the Music Building. Admission is free and the concert is open to the public. Each year, the Soirée Faculty Recital offers a wide variety of music and styles. This concert will be no different. All areas of the music department will be represented, including brass, percussion, voice, reeds, piano, and strings. Dr. Lawrence Johnson, Chair of the Department of Music at SUU, states, "The SUU Department of Music always looks forward to our annual Soirée Faculty Recital where our exceptional faculty and accompanists have the opportunity to share their talents and expertise with the university and the community. It is our audiences, after all, for whom we perform, and for whose support and encouragement we are very grateful. Therefore, we view this recital as our ‘thank you’ to all those who support the university music program, and also support this magical and transformative art we call music!" SUU Music faculty has an exceptional combination of both teaching and performing expertise. This experience has provided students with the training and professionalism to win state, regional, and national recognition for their efforts, both at SUU and after graduation. Many of the students who have studied under our faculty have gone on to teach music or pursue professional performance careers. Experience the rich sounds and talents of the faculty and staff of the Department of Music at SUU. For more information about the Department of Music and faculty members at SUU, please visit www.suu.edu/pva/music.